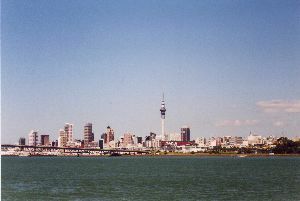 We arrived in Auckland on Saturday the 1st of March 2003. 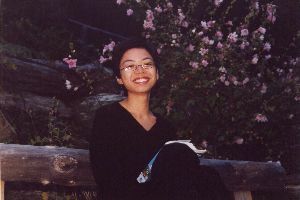 I had travelled on from Australia where I had spend the last 2 weeks, Tammay had come from London (via Hong Kong). We picked up a hire car from the airport and drove to Waitomo. During our first evening in New Zealand we went on a night walk to see the glow-worms klinging to the sides of the rock faces around Waitomo. We spent our first night at the Abseil Inn in Waitomo. 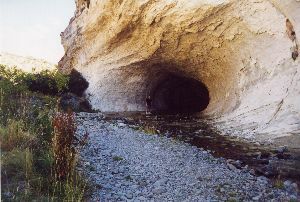 Sunday the 2nd of March, we took tours around the glow-worm caves, the Aranui cave and walked around the Raukuri Natural Tunnel Path. 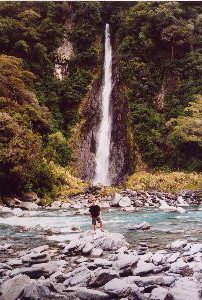 We then Headed on to the Mangapohue Natural Bridge and the Marokopa Falls. 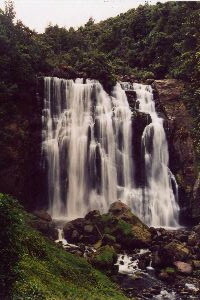 A telephoto shot of the bottom of the Falls. We finally made it to Rotorua, spending the night at the Ariki Lodge, located on the side of Lake Rotorua. Monday the 3rd of March, we went spent the morning Zorbing – a strange New Zealand invention where willing customers hurl themselves down a hill in a giant beach ball. Tammay and I decided to opt for a double wet cycle (where both of us use a single ball ankle full with water). To top the day off nicely we went white water rafting on the Kaitiaki River. We went over a 7 meter waterfall and I managed to fall out of the boat! 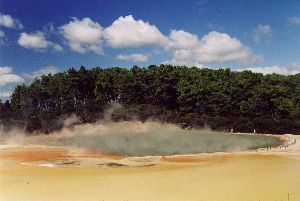 Tuesday the 4th of March, we travelled to "The Wai-o-Tapu Thermal Wonderland." 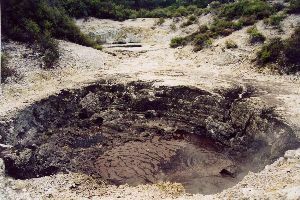 One of the many bubbling pools in The Wai-o-Tapu Thermal Wonderland. 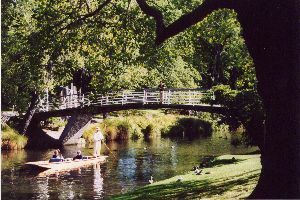 We then made our way back to Auckland passing through Cambridge (where we stopped for a milkshake). 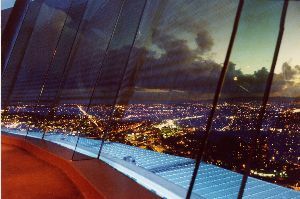 Having arrived in Auckland we checked into our hotel (The Blue Penguin) and headed into town. Of course, I then had to complete an essential item on the Richard Price tourist list. 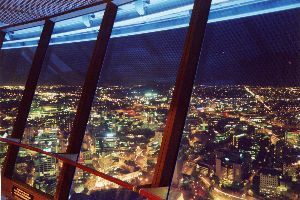 Find the city's tallest building and buy a ticket to the top! Tammay did well to stand still in this 15 second exposure! 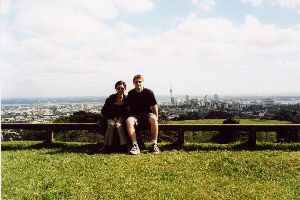 On Wednesday the 5th of March we drove to the top of Mount Eden. Taken from the top of Mount Eden, you can just about make out the cows grazing on the side of the crater. I think Tammay was a little worried the cows were going to turn nasty! 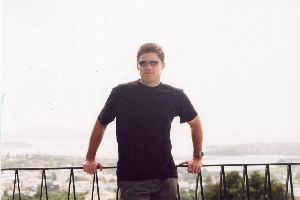 Taken on the top of Mount Eden. 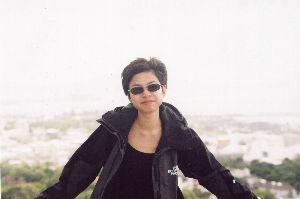 Taken on the top of Mount Eden, a (dormant) volcanic mountain just outside the city. 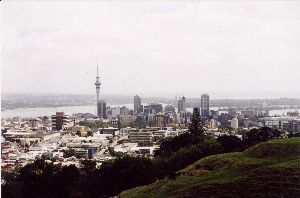 After our trip to the top of Mount Eden we returned our hire car and headed back into Auckland. 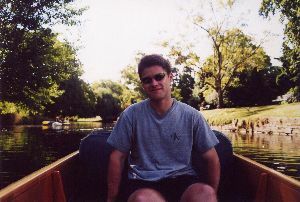 We then went on a boat trip around the harbour. The America's Cup had just been held in Auckland so the harbour was still full of boats. Following lunch on the waterfront we headed back to our hotel via Queen Street, Albert Park and the Auckland Dominion. Thursday the 6th of March we walked around Parnall and then made our way to the airport for our flight on to Christchurch on the South Island. 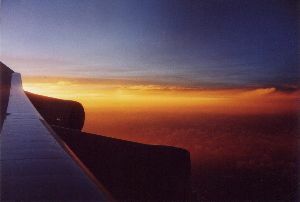 We arrived in Christchurch on the 6th of March 2003 having flown on from Auckland. We decided to stay at The Windsor Hotel in the city centre. We then made our way to the arts centre and had lunch in the Botanical Garden (a huge sandwich from Le Cafe). We then took a walk around the Botanical Garden. 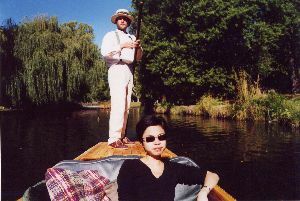 Tammay decided she wanted to do the tourist thing and go punting on the River Avon. At least I wasn't expected to do all the work! Friday the 7th of March – We got up really early and picked up our hire car. We made our way South on SH1, our first stop off was this pretty beach on the East coast. We then headed on to Timaru (about 180Km South of Christchurch) where we had lunch. 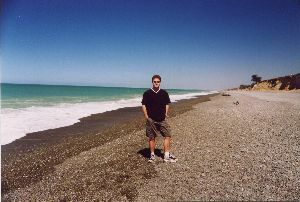 We eventually arrived in Oamaru (an extra 85Km) that afternoon. We chose to stay at the Blue Penguin Lodge. We headed back into town and had lunch at Emma's Cafe. 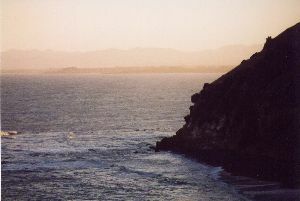 That evening we decided to go to Bushy Bay and try and spot some yellow-eyed penguins coming home from sea. After what must have been a couple of hours sitting in a hide perched atop a cliff, we only managed to spot one (and he was hiding in the foliage)! We then decided to move on to Blue Penguin Colony along Waterfront Road. Hunting for Blue Penguins proved far more successful. We saw lots! 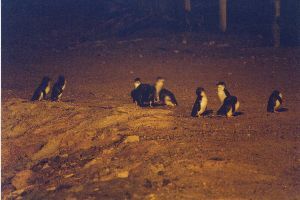 The Blue Penguin Colony is far more commercialised with a grandstand located just a few metres from where the penguins ascend the beach and cross into their nests. Saturday the 8th of March - Following a night spent at The Blue Penguin Lodge in Oamaru, we travelled further South, down the East coast of New Zealand's South island. We decided to stop off for a break and found what I believe was All Day Bay. 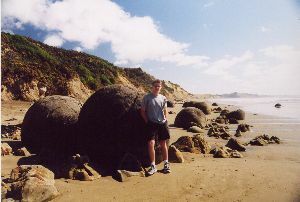 Travelling further South (about 40Km from Oamaru) we reached Moeraki. 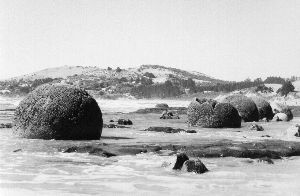 Moeraki is famous for its beach which is scattered with a large number of huge round boulders. 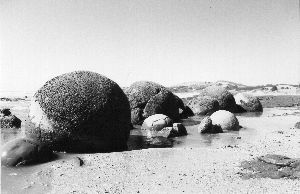 These stones are not unique to Moeraki and are created by a small concentration of bacteria within the rock causing a reaction which travels radially outward. 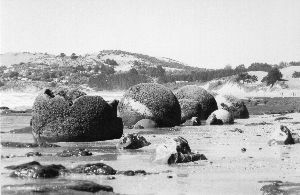 The reaction presumably increases the durability of the rock and as a result of travelling radially, creates a round stone which survives following the erosion of the surrounding rock. 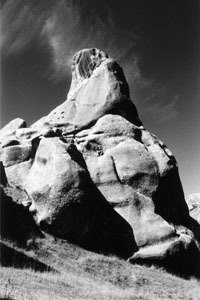 It was possible to see a number of boulders partially exposed from the cliff face at the top of the beach. 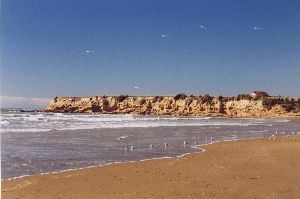 Given time, the subsequent erosion of the surrounding cliff will allow the rock to detach, leaving another perfectly round boulder on the beach. Following our walk on the beach at Moeraki, we turned around and headed North on SH1. 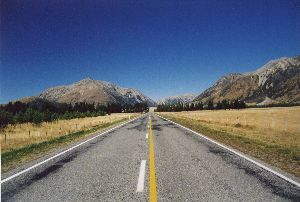 We reached Pukeuri and headed West on the 83 towards Queenstown. We stopped in Alexandra for a walk and a drink (also bought some CDs for the journey). We also stopped at Roaring Meg's lookout. 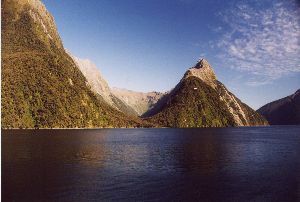 Following our arrival in Queenstown we picked out a place to stay from the Rough Guide and booked in. Despite my reservations, Tammay decided that she wanted to stay at "The Bush Creek Health Retreat". It was far too new-age for me and after I discovered the price quoted was per person, and not for the room, I wasn't exactly over the moon! The house did however have an amazing large garden, where this photo was taken. We headed into Queenstown (the adventure sports capital of the World) and spent time in front of the pier on Queenstown Bay. We had dinner at Winnie Bagoes. 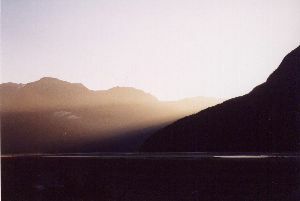 Sunday the 9th of March – After spending the night in Queenstown, we left our car at the retreat and were picked up by a minibus which took us to the airport. 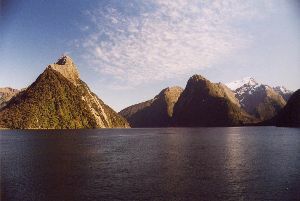 Following a short flight we landed at Milford Sound – far better than the alternative 5 hour bus trip (each way)! Following our return to Queenstown, we wandered around the town and ate lunch on the lake. 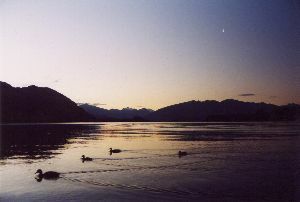 We then headed on to Wanaka. 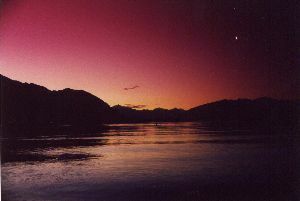 Wanaka was a place that I (and everyone else I know who has been there) loved, without knowing exactly why. We stayed at The Matterhorn South, which was a hostel, but a really great en-suite room made it feel more like a hotel. We decided to pick up a take away pizza and eat it on the beach while watching the sun go down. The ducks swimming back and forth seemed particularly interested in the food. 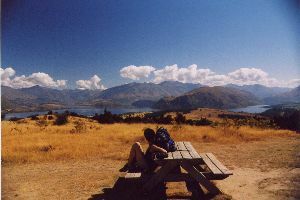 Monday the 10th of March - Had breakfast sat outside a cafe on Wanaka's lake front. We decided to go for a stroll to the top of Mount Iron, located just outside Wanaka. Although it was only a gentle climb to the top, a couple of hours in the blazing midday sun left us feeling roasted! The phrase "Mad dogs and Englishmen" comes to mind! Following an ice-cream at Cafe Paridiso which is part of Wanaka's cinema (which has sofas and a car in front of the screen), we headed on towards Haast via the Haast Pass. 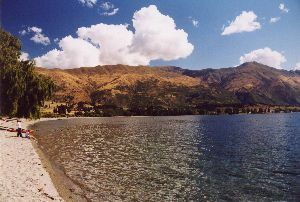 This is a photo of Lake Wanaka by day, just before we departed North for the glaciers. 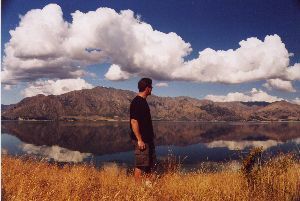 Shortly after leaving Wanaka we passed Lake Hawea. 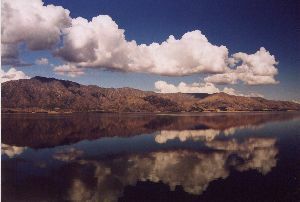 The wind had died down and the surface of the lake was like a mirror. I had to park the car at the side of the road and take the time to admire the view. Along the way we passed the Blue Pools and decided to take a look. 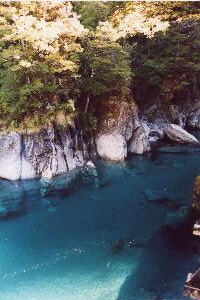 The water was crystal clear, you could clearly see the river bed even though the water was several metres deep! The area was infested with mosquitoes and Tammay got eaten alive! Tammay also got really scared by a fat American woman who decided to cross the rope bridge behind us and give us an idea what an Earth quake would feel like! A little further along the road we came to Thunder Creek Falls. 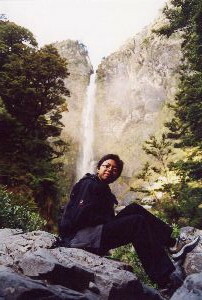 Still happy to take a break from the driving we took the short walk through the forest to the water fall. 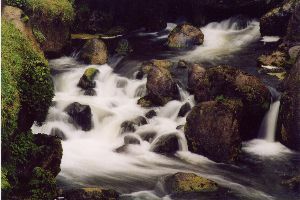 The water in front of Thunder Creek. 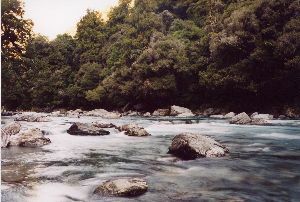 We then travelled on to Haast were we spent the night. Tuesday the 11th of March. We left our motel and decided to pick up a hitchhiker – a mad German girl with wild hair! 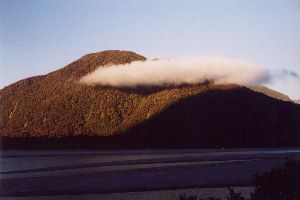 The Mauri Name for New Zealand translates to "Land of the Long White Cloud". I therefore thought it was quite fitting when I saw this cloud formation on our way to the glaciers. 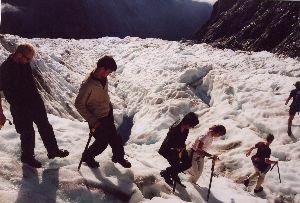 We drove on to Fox Glacier and took a walk to the bottom of the Glacier. 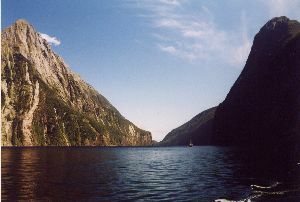 We headed on to Franz Joseph where we dropped off our passenger. We checked into a great little B & B a short drive out of town. The B & B was owned by a helicopter pilot and a lady who used to teach at a school in Angel Islington. We headed into town and had lunch at Beeches. We splashed out (again) and went on a heli-hike. 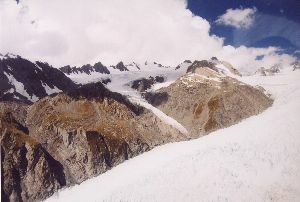 The helicopter ferried us from the town onto the glacier. 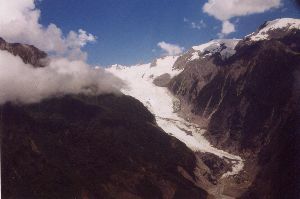 The flight gave us a great view of the glacier and surrounding area... and also saved us a couple of hours of hiking! While on the hike we found out that two of the chaps came from Wales. Within a couple of questions we had worked out that they had gone to school at Christ College (Brecon) and knew or flatmate Tom! 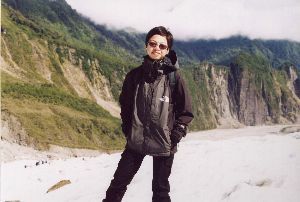 Wednesday the 12th of March - We got up early and travelled to Fox Glacier. 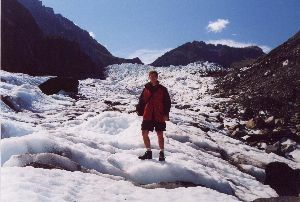 We took a half day hike (about 4 hours) although most of this was spent trekking up the valley to reach the glacier. 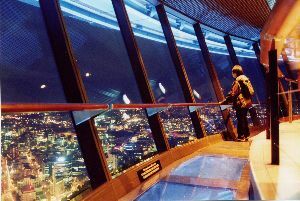 One of the people on the trip suffered from vertigo and not surprisingly had a bit of a bad time on the narrow ledges! 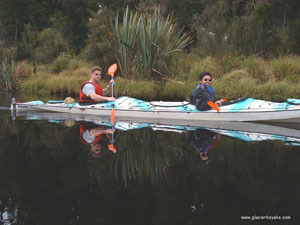 Following our hike we managed to fit in a sunset kayak on Lake Mapourika with Fergs Kayaks. Tammay was quite happy for me to do all the work. The following morning (Thursday the 13th) we walked around Lake Matherson. 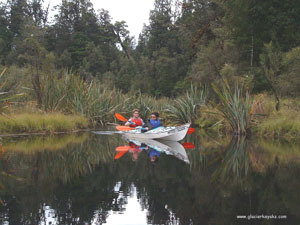 Unfortunately it was a cloudy day and we weren't able to see the picture postcard reflections of Mount Cook in the lake. We met a chap from South America who we ended up giving a lift back into Franz Joseph. 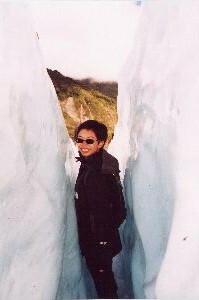 We headed on to Hokitika (where Tammay spent an inordinate amount of money on glassware) and then Arthur's Pass. 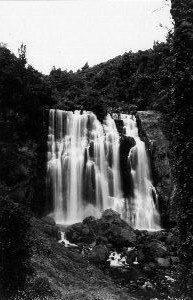 Friday the 14th of March – Following a night spent at The Chalet in Arthur's Pass, we took the short hike to the Punch-Bowl Falls. 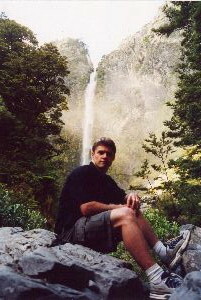 Me in front of the Punch-Bowl Falls. 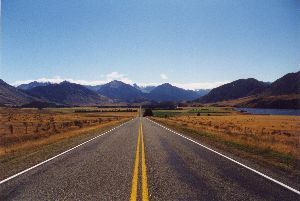 The long road back to Christchurch. I couldn't resist taking a photo. The Cave Scenic Reserve and yet another break from the driving. 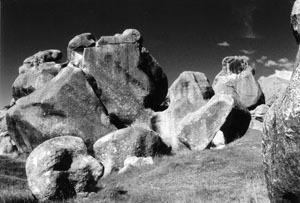 Castle Hill, or Kura Tawhiti as this holy cult-site is know by the Maori, is located between Arthur's Pass and Christchurch in a Tussock flat. 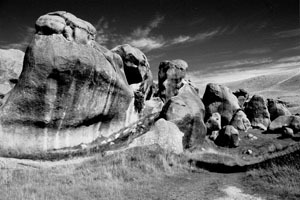 The rain-eroded sandstone formations rise up to 10m from the ground and are used to some extent for climbing. Although we didn't spot any, between some of the rocks it is possible to find 500 year old coal drawings. Tammay finally got bored of our Geology lesson and we made our way back to Christchurch. We ate dinner in the Dux le Lux and watched The Recruit at the local cinema. We left Christchurch on a flight to Auckland. A long wait at Auckland airport meant we had time to meet up with Jules and Ian who took use into Auckland for lunch. 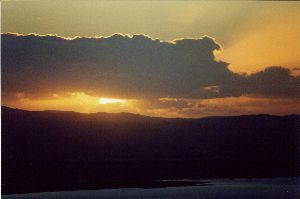 We then left Auckland on our way to L.A.